My breeding goal is for quality, not quantity, with a pretty performance horse in mind. 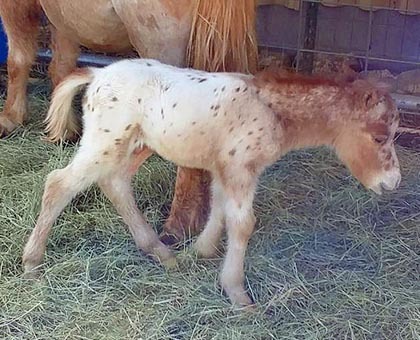 The foals here are the result of selective Appaloosa to Appaloosa breeding. 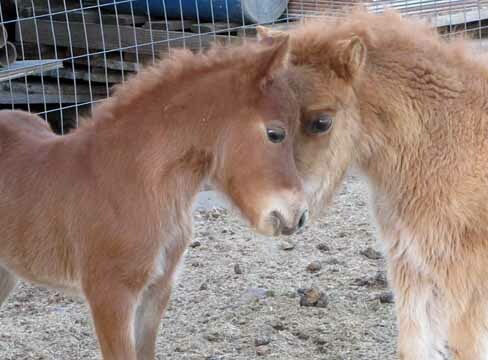 Expecting foals in April and May 2019. All will be grandsons or granddaughters of Carousel Designer Legacy. .
March 11, 2018 saw the arrival of a 'Prince' into the world! He is sired by National, Regional and World Top Ten Driving and Color stallion CR Lakota Renegade, who was sired by the incredible Carousel Designer Legacy, who was World Top Ten in Color, Halter and Driving. Renegade goes three times to Broken Lance, and his pedigree also includes other old greats such as Menelek, Chianti, Davis Comanche and Shadow Oaks Paul Bunyan through his daughter Shadow Oaks Madame Butterfly. Prince's dam was sired by multi World Halter Champion Brewers Classic Supreme, who was a grandson of Orion Light Vant Huttenest. Her dam was a granddaughter of Rowdy. 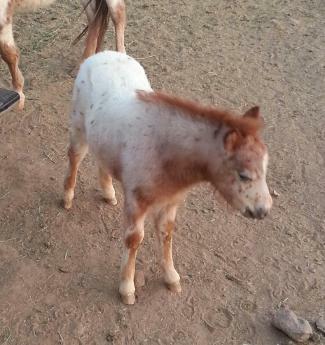 This colt is expected to mature in the 30" size range. 19" at birth with a 7" cannon bone measurement. February 23, 2016 started life for this little chestnut colt. Double bred multi World Champion Brewers Classic Supreme and going back to Rowdy on his dam's side. 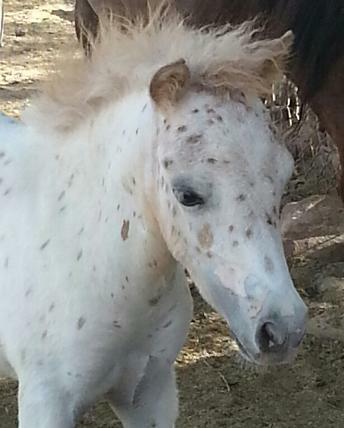 He has Appaloosa characteristics, so like the rest of his family, I expect he will color out. He will mature at about 31". This sweet boy arrived on April 13, 2016. A grandson of World Champions Brewers Classic Supreme and Bar B Littlebits Touch of Class on his sire's side, his fewspot dam is by National and Regional Top Ten CR Lakota Renegade, by Carousel Designer Legacy and out of a daughter of Yellow Diamond Little Feather. 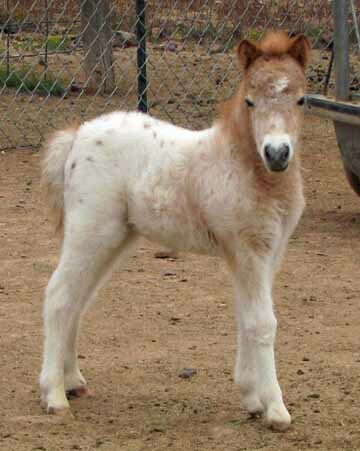 This colt has a charming personality and is very correct. He is covered with spots under the baby coat. 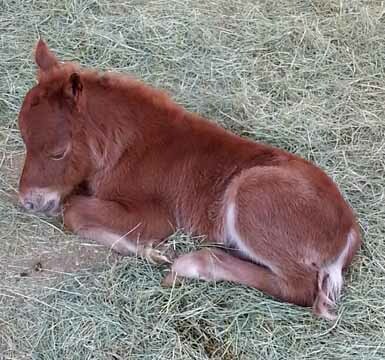 Pictured at about 10 hours old. Joker loves people and all the attention he can get. Born April 16, 2016, Mark has one of the richest deep chestnut coats I've ever seen on a baby- he looks like velvet. He is refined and dainty and already shows that he can move well. No surprise considering he is sired by a son of World Champions Brewers Classic Supreme and Bar B Littlebits Touch of Class. 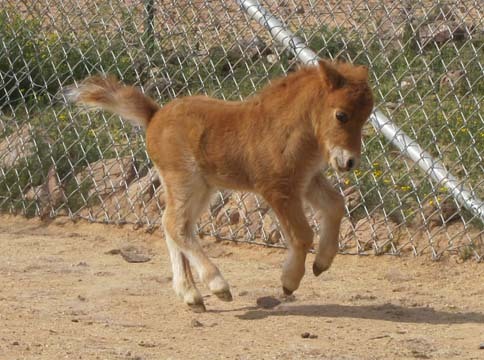 His dam's pedigree reads who's who of the Miniature and Shetland horse world. 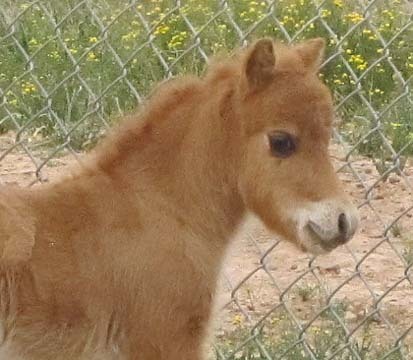 Her sire goes back to the fabulous Shetland Seth Thomas multiple times and her dam was out of two successful show horses Another Dimension Ima DWB and Sonoita Miss T2. This pedigree is loaded with too many champions to list here. Expected to mature about 33". 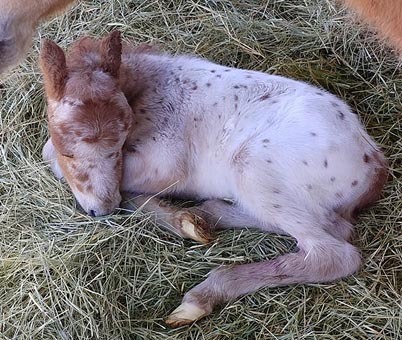 This little filly arrived on April 19, 2016. Granddaughter to both World Champions Brewers Classic Supreme and Bar B Littlebits Touch of Class. Her dam is my Regional Top Ten Classic driving mare, who is sired by National and Regional Top Ten CR Lakota Renegade, a son of none other than Carousel Designer Legacy. Her dam is a loud near leopard who goes back to Toyland Little Sombrero by Toyland Zodiac. Underneath Scarlett's heavy baby coat she is covered in spots from nose to rear. Should mature about 32".